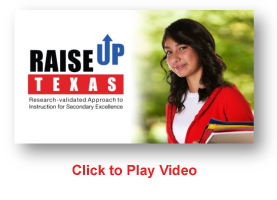 RAISEup Texas is a targeted, whole-school approach to improving student achievement in elementary and middle school. RAISEup Texas transforms teaching and learning in the entire school, with every teacher, in every subject using research-validated tools and strategies to help ALL students “learn how to learn” and think critically to meet high standards for college- and career-readiness. RAISEup Texas is powered by E3 Alliance, a nationally recognized education nonprofit located in Austin, Texas.